It's been a long, cold winter, and Vermonters are ready for spring. That much was clear on February 27, the opening day of the Vermont Flower Show. Forming the kind of slow-moving lines more often seen at Disney World, hundreds of people shuffled through an elaborate indoor garden display. They stopped to smell the tulips and to pet the lush green grass like it was something they'd never seen before — or, perhaps, thought they'd never see again. Thankfully, warmer days are right around the corner, and many of us are starting to plan our own gardens. For renters and city dwellers, however, space constraints make gardening a challenge. What do you do when your landlord won't let you dig up the back yard, or when you're limited to a 3-by-6-foot balcony? Easy: Plant a vertical garden instead. Vertical gardens are a smart alternative for folks who don't have a lot of horizontal space to work with. And they're a major trend in gardening right now, because these "living walls," as they're often called, look like a green work of art. If you've got a wall or a fence, you can turn it into a home for edibles, annuals and even perennials. These upright gardens take many shapes. Savvy folks make them out of wooden shipping pallets, old bookcases or even hanging shoe racks. Once constructed, the "gardens" require little maintenance beyond basic fertilizing and watering — there's no weeding or kneeling. 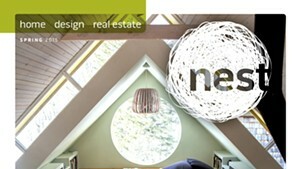 Plus, they instantly beautify your space. Nest spotted a simple but eye-catching vertical display by Gardener's Supply at the Flower Show: The gardeners had simply attached small potted plants to a hanging wooden crate with wire. Inspired, we went home and built a larger vertical garden using a trellis. Indoors, this setup would be great for seed starting or growing fresh herbs for the kitchen. Outdoors, the sky's the limit. And it's mobile. Pick it up to move it outdoors or in, and even from room to room around your house for the best light. Begin by wrapping a length of floral stem wire around the lip of a potted plant. Twist the ends of the wire together so it stays snug against the pot. With the ends of the wire, form a sturdy loop from which the pot can hang. Repeat this step for all of your pots. 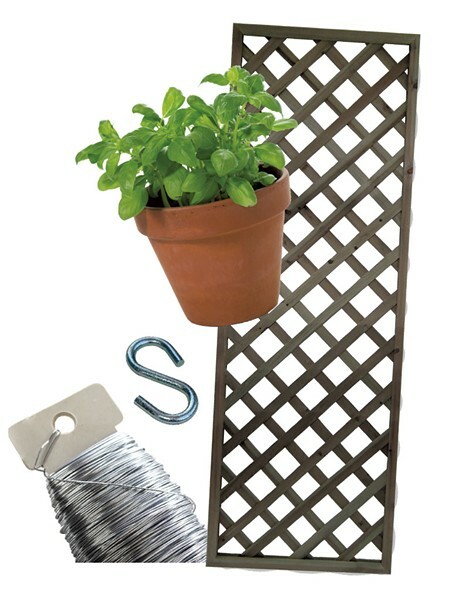 Lean your trellis against a wall where the plants can get the appropriate amount of sunlight. Hang one end of an S-hook from the trellis; use pliers to tighten it to the frame if necessary. Hang a potted plant from the other end of the hook. Repeat this step for all your plants. Water your plants as needed. For an outdoor trellis, use a hose or watering can as usual. 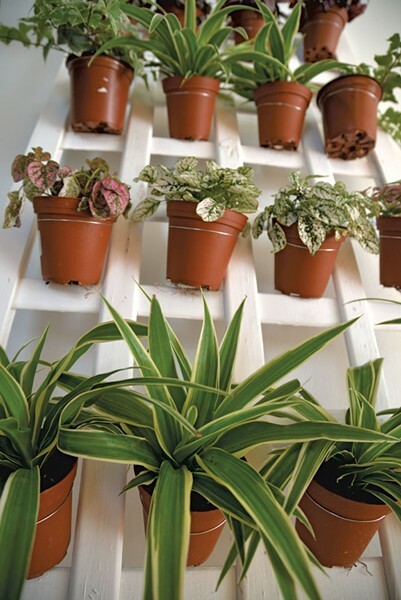 For an indoor trellis, use a spray bottle for a light mist that won't drip on your floors, or remove plants from their hooks to water and let drain at the sink. The original print version of this article was headlined "High Hopes"